October 1, 2013 marks one of the Affordable Care Act's major milestones: the opening of the health insurance exchanges in each state. The health insurance exchanges (also called "marketplaces") create a new way for employees and small businesses to buy health insurance. How will the health insurance exchanges work? Here are five basic Q&As for employees about how the individual health insurance exchanges will work. Q: Who will sell insurance plans in the new exchanges? A: It depends on which state you live in. In many states, the major carriers are offering plans on the new exchanges, although they are not required to and in some states the major carriers are not present. There may also be a some new names such as not-for-profit co-ops and new insurers. Q: How many plan choices will I have? A: This also varies by the state you live in. The administration has said they expect 90% (of the seven million people anticipated to sign up for their own coverage through the exchanges) will be in states offering plans from at least five different insurance companies. But some states or regions may have fewer carriers. Rhode Island, for instance, will only have two insurers selling individual plans in its exchange. Q: What type of coverage will the plans offer? A: All plans will be divided into metallic tiers of coverage, ranging from “bronze” to “platinum.” As the metal category increases in value, so does the percent of medical expenses that a health plan will cover. 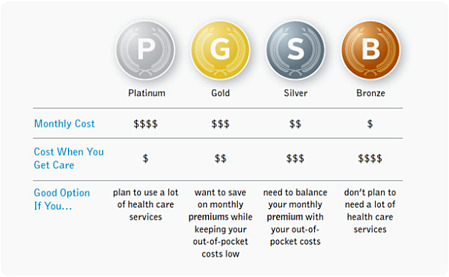 The bronze plan covers about 60% of a consumer’s health costs, the silver 70%, the gold 80% and the platinum 90%. A more limited “catastrophic” plan is available for people younger than 30. Q: Will all the plans within the "tiers" be the same? A: Not necessarily. Within the coverage tiers, each plan may have a different mix of deductibles, co-insurance, and co-pays. And, the network of doctors will vary from plan to plan. So, as you compare plans look carefully at when and how much you will pay, and which doctors are considered in-network. These will all impact how much you pay for coverage when you receive medical care. Q: How much will the plans cost? A: This also depends on the state you live in, the coverage you select, and whether you are eligible for the health insurance tax subsidies which will lower the cost you pay for your monthly premium. For example, individuals earning up to $45,960 in 2013 are eligible for a subsidy, and a family of four earning up to $94,200 in 2013 are eligible. What questions do you have about how the health insurance exchanges work? Leave a comment below and we'll answer them.